Apple Tree (Malus spp. ): growing, planting, caring. Straight out of the garden of Eden... Growing this tree doesn't require divine knowledge, and who can resist a hot apple pie? Scientific name : Malus spp. This tree stems from the Rosaceae family, so it's subject to the same pros and cons as its cousins: a beautiful selection of flowers, fruit... and similar illnesses! Apple trees like different kinds of soil (depending on their rootstock), from humid to well-drained, or rich, and they need a sunny spot to bloom and produce fruit. Apple trees are almost all grafted so buy one locally from a producer that uses rootstocks adapted to your terrain. A small, deciduous tree with serrated, alternating leaves. These oval or ovoid, rarely smooth-edged leaves sometimes turn purple. Flowering in May, often with white, pink or red flowers depending on the horticultural species. A cross section of the flowers indication they are sometime doubled or semi-doubled according to the cultivar. More or less spherical fruit. 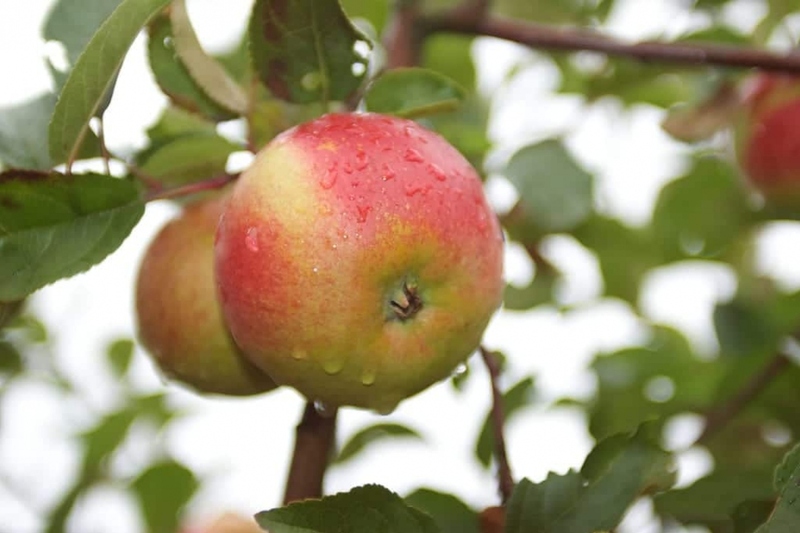 Apple trees are not self-fertilizing, so if there aren't any around, plant more than one. Choose a sunny location with ordinary-to-rich, drained soil. Keep in mind that the preferences of your apple tree may change according to the rootstock used. Planting bare roots is only done in winter where as you can plant trees with a root ball and those in a container until spring. With bare roots, carry out a treatment (shorten the roots and soak them in a mixture of soil and compost). Plant in a hole that is about 20 cm bigger than the root ball, gradually put the crumbled earth back by regularly tamping down around the roots. Water after planting with at least 50 liters of water that you will pour into a basin formed around the trunk. A tilted stake planted in the hole will be useful against strong winds as long as you don't forget to remove it after 2 year, and that you use a supple attachment. The most important goal of maintenance pruning is to keep your tree in a well adapted shape, to get rid of it's dead wood, and to let light reach the center. You need to distinguish the branches that will carry fruit — often lateral, with stems emerging horizontally from the plant — from branches that "make wood" — typically vertical, in the center of the tree. Start by removing any dead or damaged wood. Then cut any crossed branches as well as those growing inwards, clearing out the heart of the tree to let more light through. A little detail about your technique — turn your pruners so that the anvil blade (which crushes) is next to the section to be removed. Therefore, you won't risk destroying the wood that will stay on the tree! Good to know — fructification pruning, particularly pruning dying apple trees, is complex! If you really need to do so, find a professional! - In the first month and in case of drought, water abundantly but not too frequently, so that the roots will fetch water deeper. Water thoroughly, until the soil is wet and a small puddle remains around the tree. - Keep an eye on your plant during the rest of the first year - and water if the soil is dry - and of course if your plant is in a pot. Apple trees are sensitive to leaf parasites like aphids, red spiders, powdery mildew, apple scab (which destroys the fruits, and may be stopped by burning the dry leaves in autumn) and caterpillars, but attacks against it's foliage aren't too much for the tree to hand. Tree cankers and fire blight are more harmful. Some people recommend up to nine treatments with insecticides and fungicides. These products must be used with the accompanying safety mask and suit, something private individuals can't do. Choose instead organic solutions, like pheromone traps to attract insects during fructification. By the end of the summer, remember to watch regularly your apple tree: your fruits are ripe when they unhook easily from the branch.